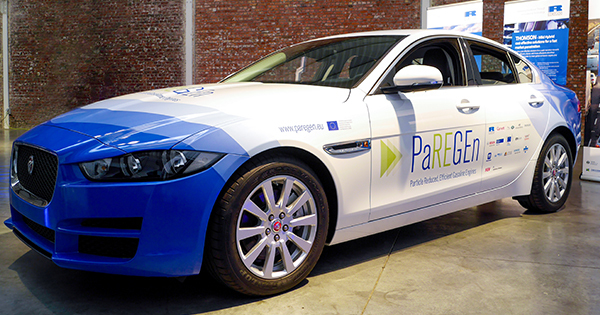 The Particle Reduced, Efficient Gasoline Engines (PaREGEn) project focuses on the twin challenges of improving the fuel efficiency of next-generation gasoline engines whilst controlling their emissions of particles. The project has committed to demonstrate a 15% CO2 reduction in mid- to premium-sized passenger cars, along with real driving emissions target compliance including measurement of particles as small as 10nm in diameter. Ricardo is coordinating the research initiative as part of a 17-partner consortium, representing all sectors of the European automotive industry. The gasoline engine is likely to continue playing a significant role in passenger cars in the coming decade, particularly in mid- to premium-sized passenger cars used for long journeys. Manufacturers of components and vehicles will need to continue to meet the demand for powertrain technology. The PaREGEn project will demonstrate both the technical and process development routes to support this need with the gasoline engine. Using state-of-the-art development techniques, such as optically accessed single cylinder engines, a range of modelling and simulation tools, and the application of novel engine componentry, the optimal trade-offs between cleanliness and efficiency are being identified for such next-generation gasoline engines. Independent assessment of their performance and impact to track the progress of the project towards reaching the targets. Specifically, as well as coordinating the project, Ricardo and its work package partners are developing a homogeneous lean-burn, direct-injection engine matched with a lean gasoline aftertreatment system at up to TRL 7. A full demonstrator vehicle has been built and is undergoing development testing. Please tick the boxes below if you give consent for Ricardo to contact you with additional information on our services, products or events. Your information will be stored on our secure systems, will not be shared with 3rd parties, click here for Ricardo’s privacy notice.